We've become increasingly convinced in recent years that South Africa's film industry is one to watch, a young generation of intriguing talent very much on the rise throughout the country. And as we build our list of names to keep an eye on it would appear that writer-director Willem Grobler is another to mark down. Thomas has been hearing the crippling hum for so long that he can hardly remember when things started going wrong. To make matters worse, nobody else hears it, and so Thomas agrees to go for electroshock therapy to overcome the hum for good. This leads to memory loss, and Thomas resumes sessions with his psychiatrist Dr. Swart in order to unravel his past so that he can win back Jana, the love of his life. But the ceaseless hum continues to haunt him, and he starts to feel like he is under constant surveillance. 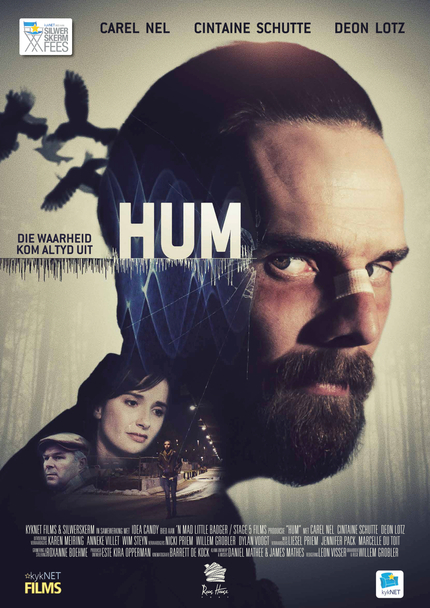 Despite all of this, Thomas is convinced that he’s getting closer to the truth behind the hum, as well as the likelihood that he can finally convince Jana of his sanity... But how much more can he truly sacrifice before his obsession takes the ultimate toll? Carel Nel, Cintaine Schutte and Deon Lotz star in the film and we're pleased to share the trailer below.